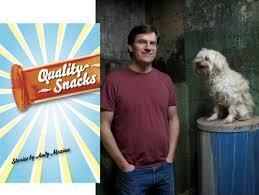 Andy Mozina's second book, Quality Snacks, features fifteen short stories about the characters that he grew up with in the Brookfield/Milwaukee area. In Quality Snacks, Mozina, who is a professor of English at Kalamazoo College in Michigan, finds many of his characters inhabiting the Milwaukee area of his own childhood. "People in Milwaukee, you know, they would chop down trees and pour metal into molds and build farm equipment, and then winter would come and they would drink," says Mozina. "And that's us." Fifteen stories make up the new collection, which he'll talk about tonight at Boswell Book Company in Milwaukee.